Can tabs chandelier is going to be a great fun and art activity for you. 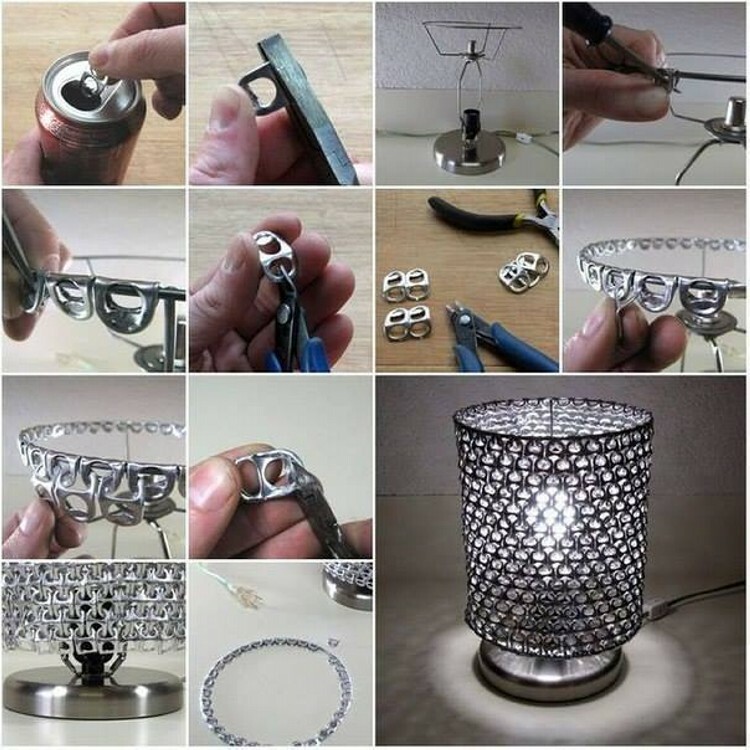 In this DIY article we are going to discuss how to make this can tab chandelier which is going to lighten up your room space. This would also offer you something greatly different and unique. All you need to arrange for this is a couple of ordinary and easily available things like can tabs, metallic wire or string, an Edison bulb and that’s it. First of all remove the tabs from the can or tin by pushing it back and forth until the metal fatigues and breaks. Estimations in this regard are as, the top and bottom wire hoops wrapped with tabs add about ¼ inches of height apiece. So estimate your required number of tabs beforehand. Now you need to mold them so hold the tab from the short dimension with some pliers and turn or mold it with your thumb. They should be bent approximately 20 to 25 degrees. These bent tabs are the ones which are going to be used in top and bottom rows, rest of them should stay same. Now start with an uncut tab, set it on the top string hoop. Angling the hoop with the bend and with the finger pressure bend it about 90 degrees. Continue adding the tabs around the circumference of the top hoop until all is covered. Now snip the tabs using side cutters from the middle of bigger dimension. Using finger pressure open the cut loop in a single tab, pass the bottom loops of two adjacent hoop clips through the cut loop, now press it back and close it up. Now continue adding tabs in the same pattern until you are done with the first row. Make it the size as big as you want. Tabs in the last row should be trimmed a bit to have a smooth flat surface. Now wrap the bottom hoop in uncut tabs that will join it to the mail above. Now fix the bottom clips in to the mail as we did earlier. Now work all the way around the bottom hoop, fixing clips. Install the Edison bulb and its all set to lighten up your room.